How does design-build differ from design-bid-build (DBB)? 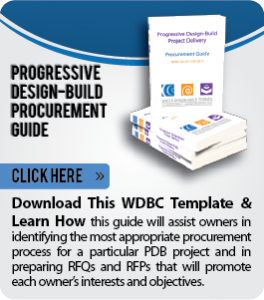 Unlike Design Build, the traditional design-bid-build approach entails two prime agreements with an owner for the delivery of a capital project. The first agreement is with an architect / engineer for the design of the project. The second contract is usually secured through a public bidding process with the lowest responsible bidder normally awarded the construction contract. For example, if an owner wants to build a new water treatment plant using DBB, the owner issues a Request for Proposal (RFP) to engineering firms for the design services, selects the most qualified firm among those responding to the RFP, and negotiates a fee such services. The engineering firm then develops the project design and bidding documents. Once a design has been accepted, the owner solicits sealed bids from construction firms to build the project utilizing the design produced by the previously selected architect / the engineering firm. A construction contract is awarded to the lowest responsible bidder who has the responsibility to build the project and commission it prior to turning over to the owner for long term operations. Design-build allows the owner to contract with a single entity for both the design and construction of the project. Design-build is a contracting approach under which both project design and construction are sourced to an Owner through a single entity that assumes responsibility for the design, construction, commissioning, and turnover of a capital project. Why has the use of design-build for public water and wastewater systems grown so rapidly? The drivers for the need to upgrade and expand water and wastewater systems include population growth and economic development, the need to replace aging systems that are beyond their useful life, and certain regulatory requirements for protecting water supplies and stream water quality. Experience has shown that design-build an efficient and cost competitive model for the delivery of new systems. Moreover, design build has resulted in substantial time and cost savings when compared to DBB delivery. Is design-build right for every project? No single delivery method is suitable for every project. Design-build is best suited for a project where basic performance and technical requirements can largely be agreed upon prior to design and construction of the project. The owner must be willing to set such requirements and allow the service provider to fulfill them in the best possible way. If a project is not clearly defined at the outset or may need constant owner input at different steps in the process, then design-build may not be appropriate. However, when speed of completion is a priority, then design-build may be the most attractive option. What are the potential disadvantages for an owner? Design-build requires discipline on the part of owner to make decisions earlier on in the process to establish the framework for the delivery of a successful project. Those clients who want to have continuous influence over detailed design and throughout the construction phase will have difficulty adjusting to design-build. Will I save money with design-build? Maybe. Design-build has the potential to reduce overall project costs by eliminating the potential for conflicts between the designer and the contractor. If the owner makes design changes during the project, design-build may become more expensive. The potential benefits of design-build for an owner include a single point of responsibility for both design and construction, simplified contracting and speed of project delivery; often these approaches can save money, but not on every project. Design-build saves time, but will the quality of the product be as good as with design-bid-build? Yes. As long as the technical and performance required are adhered to by the Design Build team, the final project will be comparable to or better than a design-bid-build project, without the potential for designer-contractor conflicts that can cause delays and additional problems. To further, ensure the quality of any project a formal Quality Assurance and Quality Control must be in place and utilized throughout the delivery of a project. Who has the responsibility for over-runs? This is negotiated prior to execution of a project agreement. Overruns that result from owner-directed changes to the design during the project delivery are usually borne by the owner. Conversely, overruns that occur in the absence of any owner directed change in the scope of the contract are usually the responsibility of the design-build service provider. Do design-build projects preclude participation of small firms? Not at all. In many cases smaller firms can partner with other firms to complete a project. An example of such an arrangement can occur when a small design firm does not have construction capabilities. In such a scenario, it may find a construction partner and propose on a project together as one entity. Similarly, the scenario could exist where a construction firm needs a design partner and they form a team to compete for a project. Either of the latter arrangements can provide benefits similar to those delivered by a single integrated design-build firm. Lastly, small firms can participate as specialty engineering or construction subcontractors to the design build team. How can an owner avoid the perception of favoritism in procurement decisions for design-build projects? Such a perception can be an issue for an Owner. However, it can be mitigated by ensuring that the bidding process is competitive, open, and transparent, and that the final contracts can withstand rigorous scrutiny by all parties, especially the public.